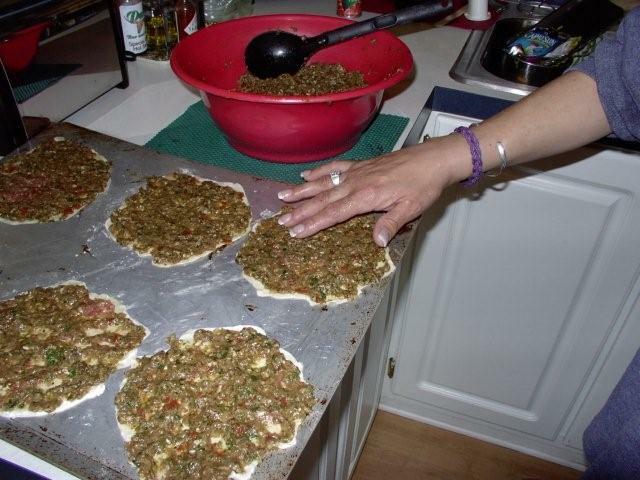 This favorite Armenian snack is the Middle Eastern version of the pizza but it has a much thinner crust, more like flour tortilla. 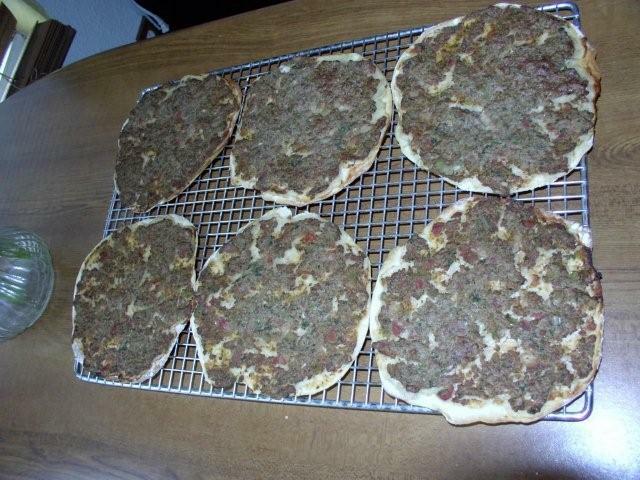 A mixture of ground lamb or ground beef with parsley, garlic, green pepper and, onion gives the lahmajoon its distinctive taste. 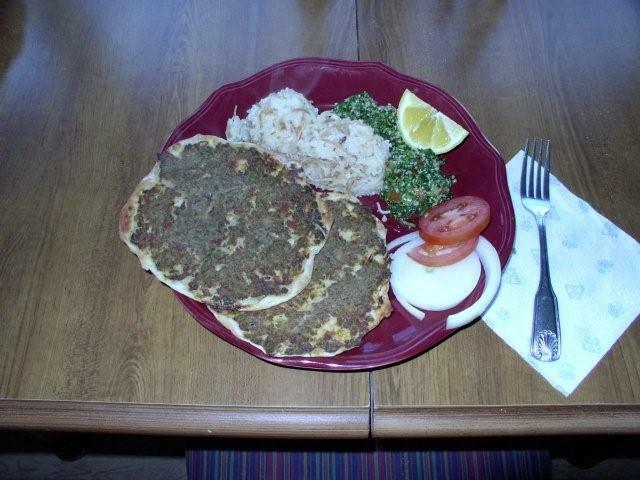 Unlike pizzas that are large and shared, the smaller lahmajoon is usually served individually . The topping is a fine grained mixture. Put all vegetables including tomatoes through a grinder using fine grate. Add the meat to the mixture and put through the grinder again. Mix meat and vegetables mixture with spices, tomato paste, juice from whole tomatoes and the juice of the two lemons. Mix well, cover and chill. Dissolve yeast in 1 cup of the water, add a pinch of sugar to help it react. Dissolve yeast in 1 cup of the water, add a pinch of sugar to help it react. Place flour in a large mixing bowl. To the yeast add the salt, oil and remainder of the water, stir well and pour over the flour. Mix well and pour out onto a floured board, knead until smooth and elastic. This dough will be much looser than bread dough. Place in bowl, cover and let rise until doubled (1-2 hrs depending on inside temperature). When doubled punch down and divide in to 36 balls of equal size. Roll each into a circle about 6" in diameter. Remove the filling from the fridge just before you start to roll the circles and let come to room temperature. Taste adjust seasonings now. It should taste spicy. Completion: In batches, place rolled circles on cookie sheet and spread the filling to the edges pressing down gently but firmly. The filling should be about l/4" thick or so. Bake in a preheated 500°F oven on the lowest rack. Cook for about 6-10 minutes or until dough just starts to turn color. 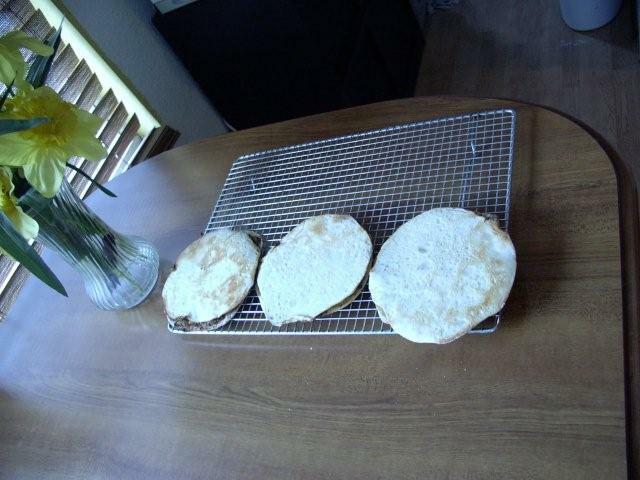 Remove and place on a wire rack, placing two together (one up and the other facing down) until all dough and filling is used up. Keep lightly covered with towel to keep from drying out. You can stack about a dozen this way. Cool, refrigerate or freeze. They freeze great. To reheat, place in moderate oven, one up and one down, like they were stacked, directly on the oven rack for about 3-4 minutes. Keep an eye out, they don’t take long to reheat. You can reheat in the microwave. 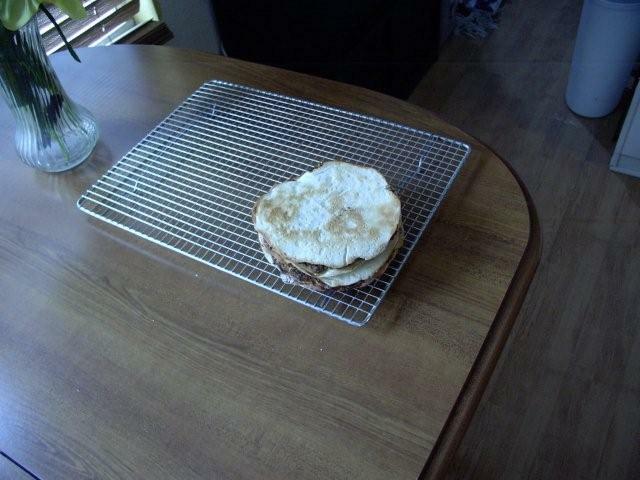 The usual is two stacked together for about 1 minute but your microwave time will vary. Serve with sliced lemon wedges. 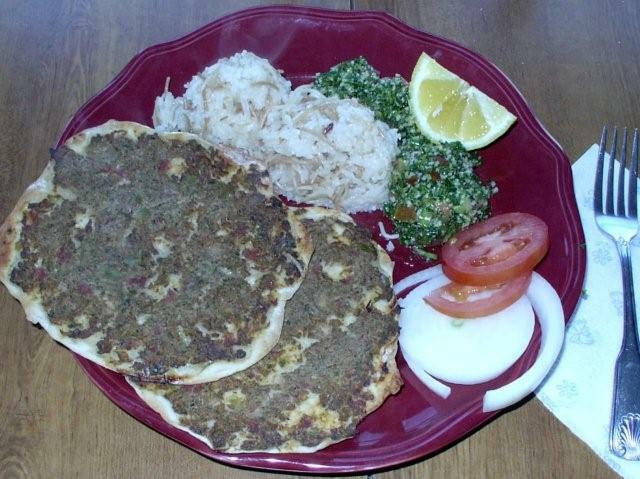 Good accompaniments are tabouli salad, pita bread, string cheese and rice pilaf. Or, just as is, they are yummy! Variations Make a slightly different dough (for the pasta machine) and roll through until you have a sheet about 4-5" wide and however long. Slice off a section about 6-8" and proceed as above. Now I know Meds Mama would roll over if she saw a square Lahmajoon but then she never had a microwave to warm them up in either. I always have a hard time rolling out circles Mine come out looking much like a scalloped circle or, better yet, they resemble a circle drawn freehand by your left foot. I don't think the shape is important since my kids have devoured even the oddest shaped ones without the least hesitation. After all, taste is the key factor and these are yummy. 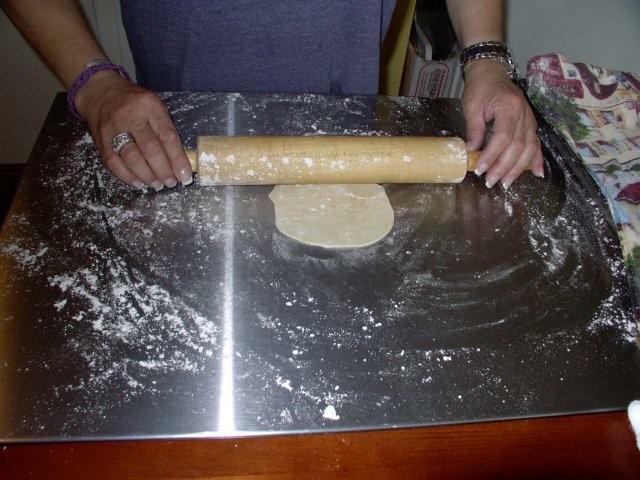 Rolling the dough through the machine lets you accomplish this task much faster than rolling by hand. A word of caution, if you are going to do the roll out by hand method, then start in the morning, because this will be an all day event. I have always found that while doing this we can make the salad, and start the pilaf. After the time you are done, pour a glass of wine, wipe off your hands and enjoy the fruits of your labor. If you are going to make the dough the machine way it takes a lot less time. 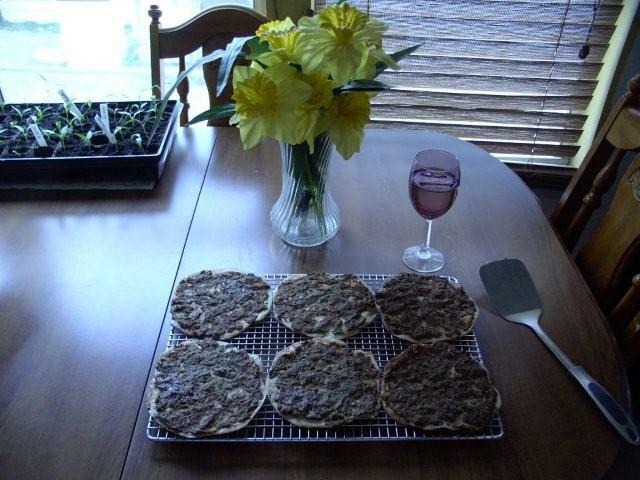 You can still start the rest of the dishes if you want, but by all means, have that glass of wine. For a great cook deserves a toast. Cheers! Here's to your health and may you always find pleasure and adventure in new recipes. Return to Cookbook Contents Page Questions about this recipe? We would love to hear from you.